The TMP1700/420 is the lowest cost PINSTAMP® Marking System. The rugged TMP1700 marking head features a compact 38mm x 63mm marking window, and marking speeds up to six characters per second. It's an excellent choice for many factory-automated or on-line processes. Nichol Industries is Australia’s leading supplier of parts marking machines and permanent Identification solutions. 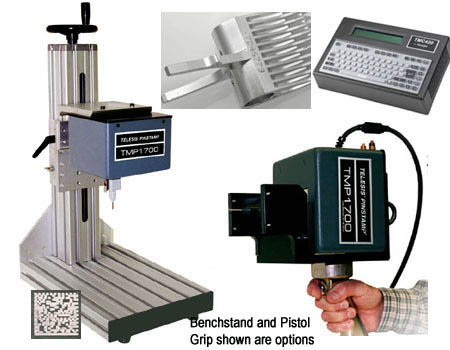 Utilizing Dot peen, Pinstamp, Laser or impact press our machines mark Deeply, Quickly and effectively whilst permanently marking and identifying components off-line, or in line with Lean Manufacturing principles, through ‘direct part marking’. To ensure we provide you with the best solution for your particular application, we work closely with you throughout the whole process. From supplying ‘off-tool’ samples to contract marking, through special purpose machine design to final commissioning is all handled directly by Nichol Industries. Nichol Industries is a wholly Australian Owned company and have been providing Identification solutions since 1952. With representation all over Australia, we offer samples of marked product or, if you prefer, send us your component to mark, we'll quickly mark it and send it back to you, with no obligation. We contract mark too if that's what you prefer. Mention IndustrySearch so Nichol Industries can best assist you! Get a callback from an expert at Nichol Industries to help answer your questions.